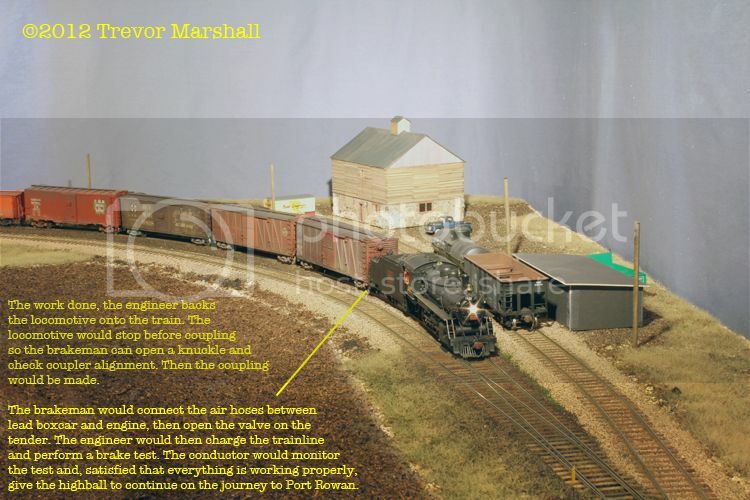 As an example, how would one model the Port Rowan branch in the dawn of the 20th century? The equipment would change, the track might have some minor adjustments, and there might be some changes to the details on the structures. And that’s where most modellers would call it a day. Doug, however, would want to know how we could demonstrate the culture of the railroad and the spirit of the community. It was also from Doug that I first heard the concept of “modelling jobs” – something that’s big on my list of ways to make my modest layout entertaining for me and my guests. 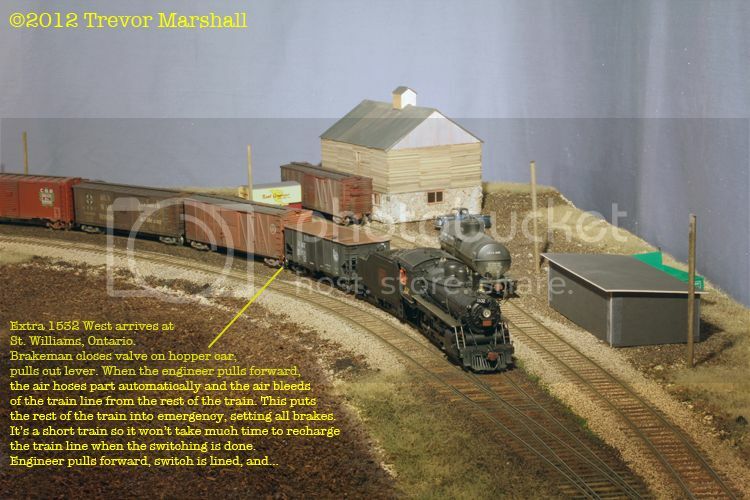 While Doug did not give me the idea of using fascia-mounted brake wheels and air hoses as operations aids, or tell me when and where to use them, it was conversations with Doug over the years that fostered my interest in finding ways to help model the jobs of railroading in miniature. And that’s what made me consider fascia tools in the first place, and then research how brakes are used during switching so I could emulate that. Occasionally, I look beyond my own chosen little corner of the world and offer up suggestions for relatively simple layout themes that I think would offer the hobbyist a project that’s both attainable and satisfying. 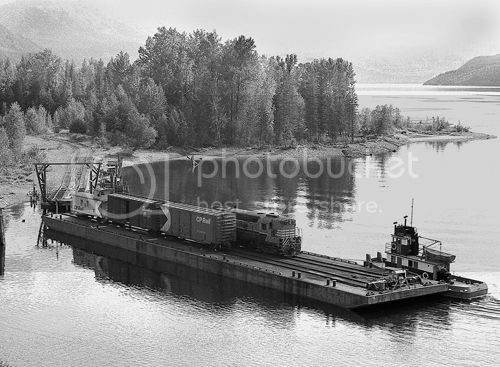 Since places where the rail meets the water are always interesting, here’s one from Canada’s westernmost province. 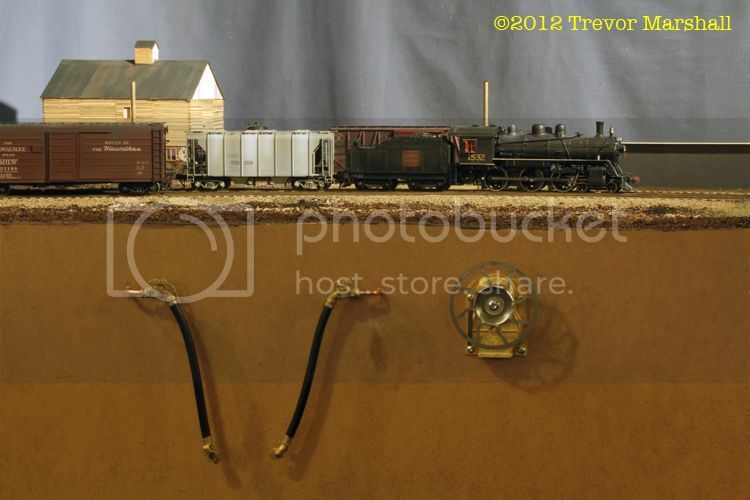 Model railways love big basements, and that means most enthusiasts live in the suburbs. Living as I do in the downtown of a major city, I don’t have too many friends in the hobby who are close by. It’s always a delight to have Dave over for coffee and conversation – and this time, an operating session on my Port Rowan layout. David models in On3 (we know each other though our mutual appreciation for O scale narrow gauge modelling), and he prefers stuff that’s smaller than what one finds on the big Colorado three-footers, so it was interesting that he noted that the S scale standard gauge equipment I have compares favourably in size to his O scale narrow gauge models. 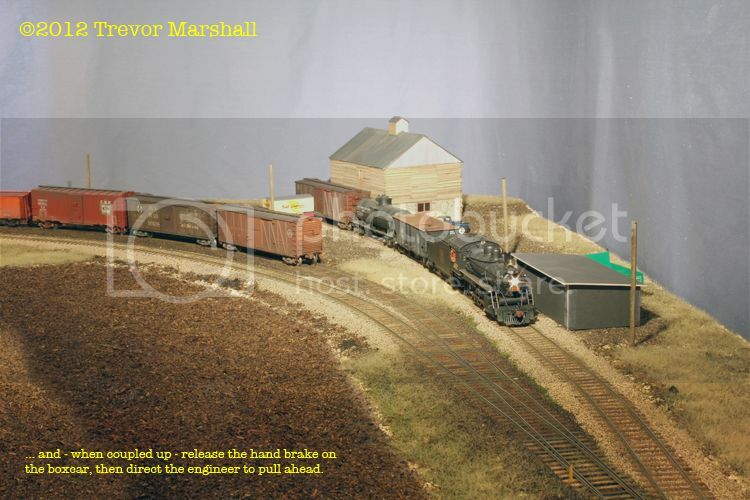 I too have noted that relationship – my CNR 10-wheelers are about the size of the Maine two-foot gauge Big Forneys – the 2-4-4Ts such as the Sandy River and Rangeley Lakes #10 and the Bridgton and Saco River #8 – that I used to run on my On2 layout. 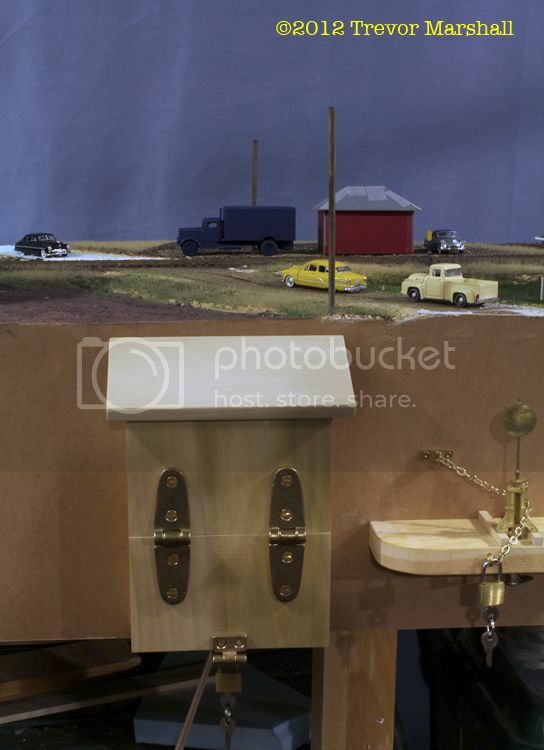 Today was the first day that I’d had a friend over to run trains since I added the operations aids – the brake wheels, air hoses, and waybill boxes – to the layout. So I prepped a bunch of waybills and empty car bills this morning, loaded the waybill boxes, and we ran a wayfreight from Simcoe to Port Rowan and return. Extra 1532 West had a fair bit of switching to do – lifting one car and spotting three in St. Williams, and lifting two cars and spotting one in Port Rowan, with cars that needed to be moved and respotted in both locations. It was way more work than one would have seen on the prototype in the 1950s, but I really wanted to put the operations aids to good work. And work we did – more than 90 minutes to do the round trip. Overall, the session went really well and David seemed to enjoy the work. I sure did. The aids definitely added to the sense of doing something – more than one would experience if one simply paused and said, “I’m hooking up the air hoses” or “I’m setting the hand brake”. At the same time, they didn’t feel unnatural or gimacky – at least, I didn’t think so. There were a few problems – the team track switch at St. Williams might be a bit tight in gauge, and one car derailed on the switch to the team track spur in Port Rowan. I’ve made a note of the cars involved and the locations and will haul out the standards gauge and make adjustments as needed. I’ll also check the cars to make sure that I haven’t tightened the truck screws too tightly. David – great to see you and let’s do it again soon! My recent postings on using brakes reminds me that Fred Carlson wrote an excellent article called Air Brakes for Model Railroaders that appeared in the November 1994 issue of Model Railroader magazine. Well worth another look if you have a copy. Brakes + Air: When + Where? When I added the brake wheel and air hose operations aids to my layout fascia, I had a reasonably good understanding of when these items would be used while switching cars. But then as I started to actually use these aids, questions arose – mostly around the order in which a crew would do things involving hand brakes, air brakes, and couplers. 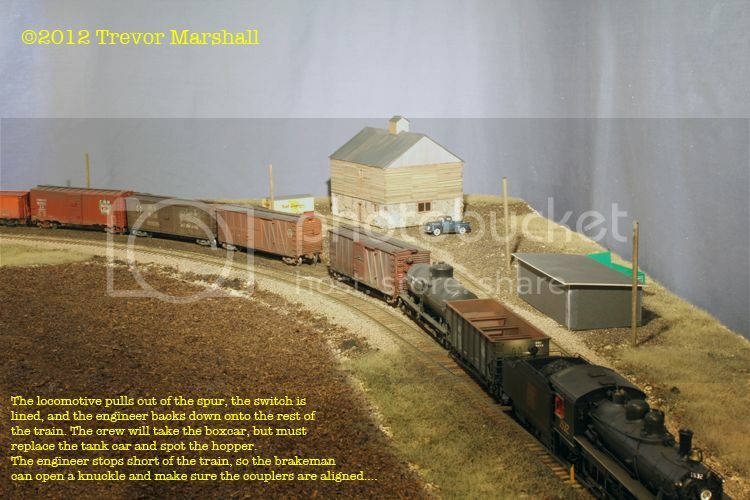 So, I decided to pick the brains of a few pros I know – railroaders, current and retired, who are also model railway enthusiasts and therefore would understand what I’m trying to do. I set up a switching sequence in St. Williams that I feel covers most situations on the layout – including set offs, lifts, and the re-spotting of cars that need to be moved to perform the other work. 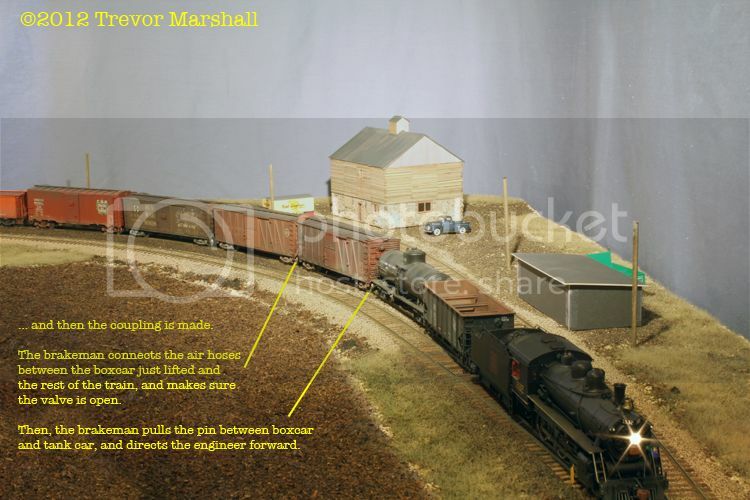 I then switched the sequence, taking photos and making notes about when I thought handbrakes would be set or released, glad hands would be connected, train air line valves would be opened, brake tests conducted, cut levers pulled, couplers checked for alignment, etc. I then shared this with my railroading friends and sought their feedback. It turns out I had a good (if basic) understanding of the proper sequence for switching, although I’d missed some significant things such as the need to bleed air from the brake system when spotting cars. My sequence assumes a two-person crew – an engineer and a conductor/brakeman (which is what I’ll be using on the layout). In the 1950s, there would be two brakemen on the ground to speed up the switching but as one of my pros put it, “I think I heard the other guy say he was going to the general store for some supplies.” I expect that’s what happened. Engine and car goes [into the spur] and couples up [to the tank car and boxcar] and pulls out to the switch and the boxcar [being lifted] is kicked onto the train. One brakeman at switch and other pulling the pin. 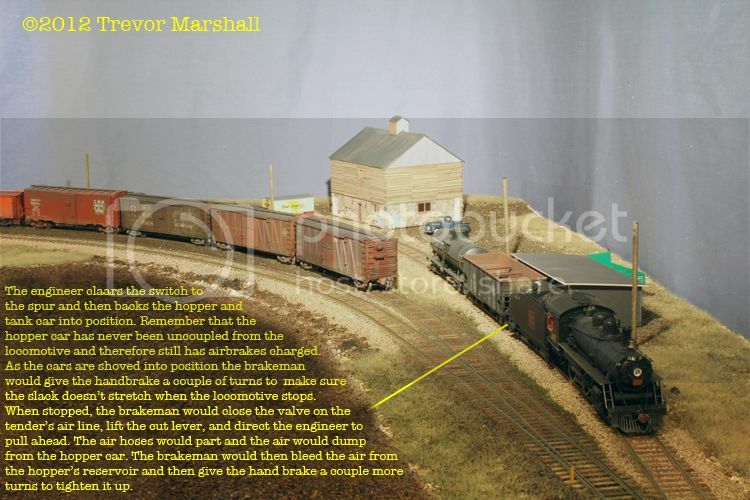 If the brakeman are experienced, the two cars [the tank car being re-spotted and the hopper car being spotted] would be kicked into the spur track and tail end brakeman would ride the cars back and tie them down on spot. All this done without air in cars. You learn to spot the cars on the first kick or the hogger and conductor will chew you out. Before I got set up we did this a lot… the jobs you work regularly you could do this with your eyes closed. Most sidings had a grade so one would know which way the cars roll… if they roll out [of the spur], the tail end man would release the brakes and the cars would roll out to the engine at the switch. 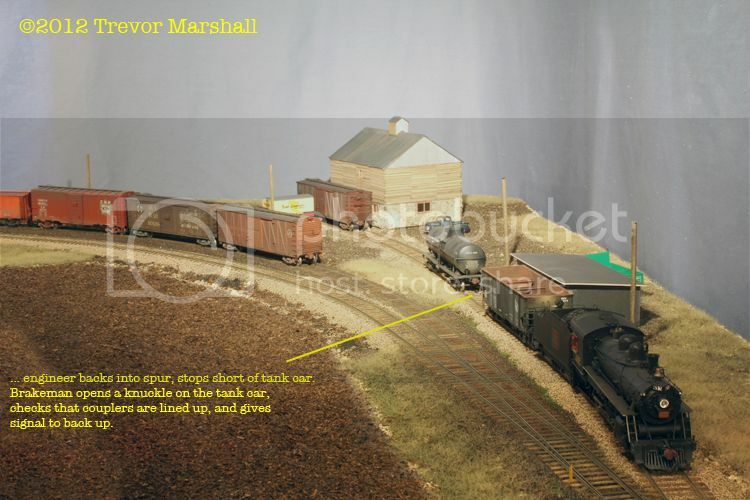 My way freight expert noted, however, that “by the book” is a more attainable approach on model railroads, because our cars don’t have the mass to for kicking cars or to take advantage of the slight grades one might find on a spur. Still, very interesting stuff. Not only has my understanding of switching improved, but so has my appreciation for the talents of train crews. While full names will not be revealed shared to protect the reputations of my sources, my thanks to G, J and D for their input! Actually, I’ve just placed an order with Arttista for a batch of figures. 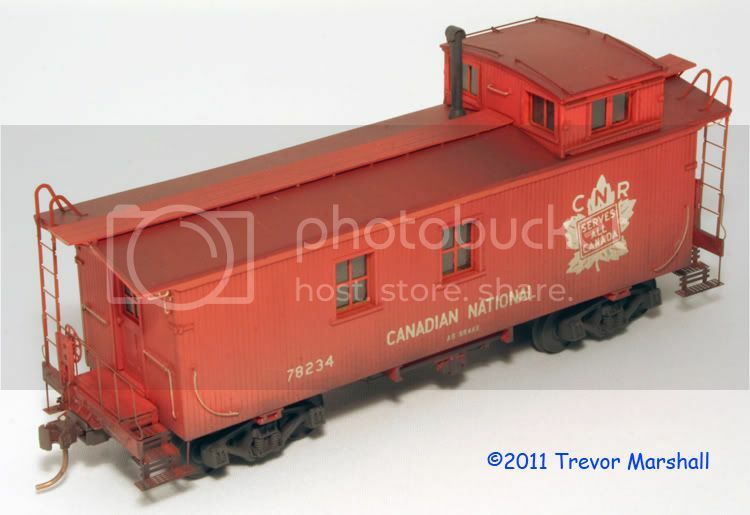 I have some of these in stock but realized I need more, especially some crew members to ride the platforms on my Ridgehill Scale Models CN Vans. My latest copy of CN Lines – the excellent magazine produced by the Canadian National Railways Historical Association – included a flyer for a new series of books covering Canadian National steam locomotives – and it sounds very exciting. This series starts with Canadian National Steam! This 248-page book will be supplemented by seven roster volumes. 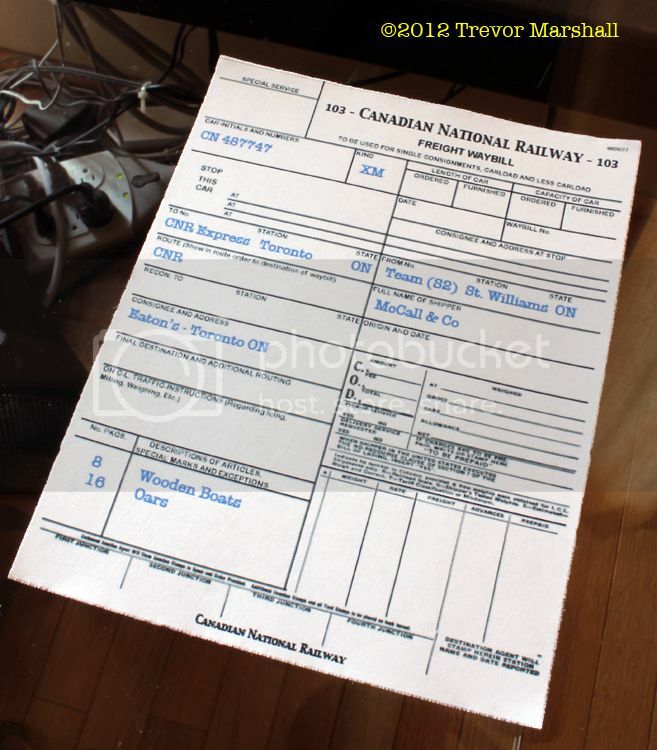 In all, the series promises more than 1,200 photos and lots of great information about the more than 4,300 steam locomotives on the roster of the CNR and its subsidiaries. I have nothing to do with the publication of this – just an excited book buyer, and thought I’d share. Follow this link to the publisher’s web site for more information. Congrats, Pierre: All the rest is scenery! 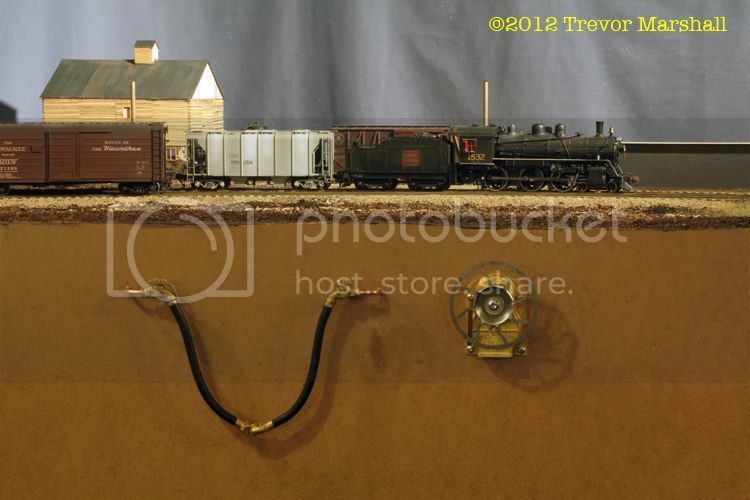 My friend Pierre Oliver is celebrating an important milestone on his layout: As he notes on his blog, he’s just finished all the wiring on his HO scale Wabash layout. Well done, my friend – and glad I could contribute. Enjoy running the trains! Regular readers of this blog will know that I’m a big fan of the approach Lance Mindheim is taking for his modern-era CSX Miami layout. Lance and I seem to think along the same lines – especially on the subject of finding ways to help model the job of railroading. Modelling the job changes the focus of a layout – from the trains, to the people who operate them. I could have used more conventional methods of turnout control – anything from ground throws to stall motors with fascia-mounted push-buttons – and from the perspective of the trains, the job would’ve been accomplished: The turnout would line for either route, as required. 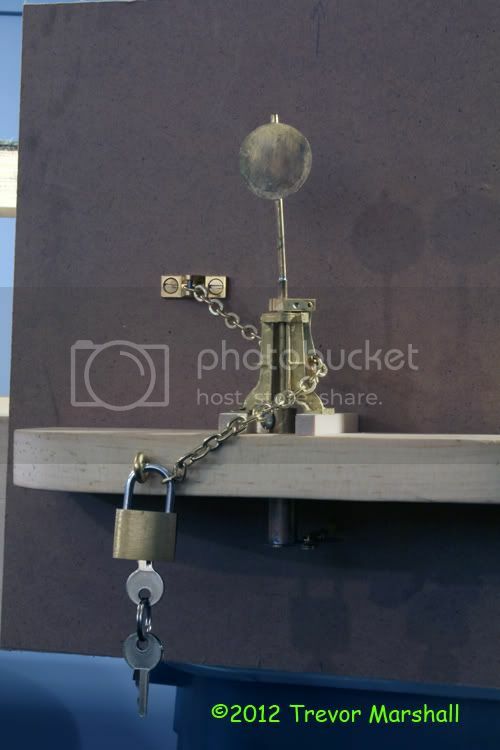 But with the switch stands, the brakeman on my layout enjoys the experience of unlocking the switch stand, lifting the lever, rotating it to the other position, and dropping the lever… then locking up the stand after the work is done. Another example of modelling the job is the recent addition of waybill boxes – also with padlocks. These perform the same function as the pigeon holes traditionally employed in car-card operating schemes. 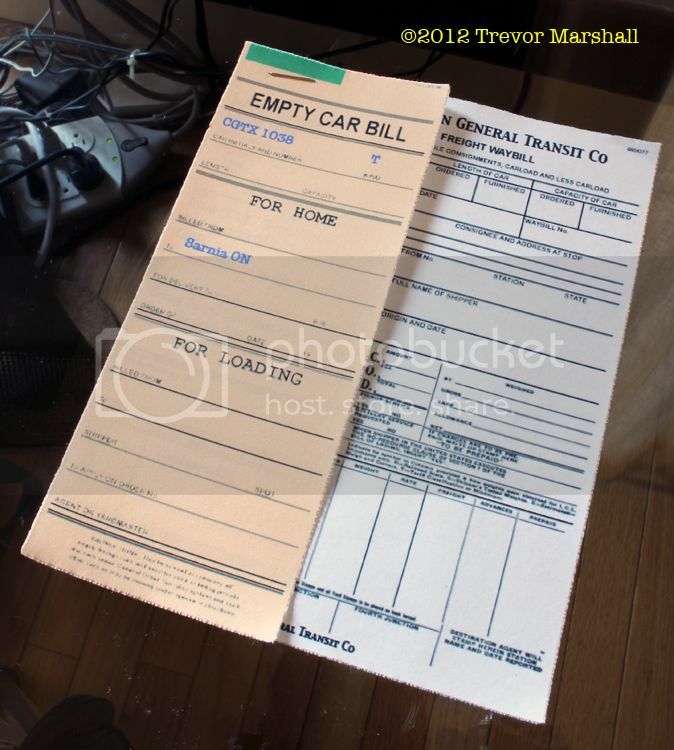 But the waybills and empty car bills I’m employing look and feel more like the real thing, and the waybill boxes duplicate the actions a real conductor would undertake to deposit or collect waybills at an un-staffed station, yard office or junction point. Lance wrote about the importance of setting (and releasing) hand brakes, noting it’s a part of almost every switching move and therefore should be duplicated during operating sessions. As Lance notes, the easiest way to do this is to pause while switching to represent the time taken to set or release the hand brake on one or more cars. But let’s be honest, how many of us will remember to do that? Similarly, how many of us will remember to connect air hoses between cars when switching is finished and our train is ready to head to the next location? Lance solves the handbrake problem by mounting valve stems at strategic locations around his layout to allow the brakeman to actually model the job. I liked this idea and decided I could do something similar for my layout. At the same time, I also came up with a way for brakemen to connect air hoses. To make the brake wheels turn, I needed to drill out the hole in the centre of the brake housing. 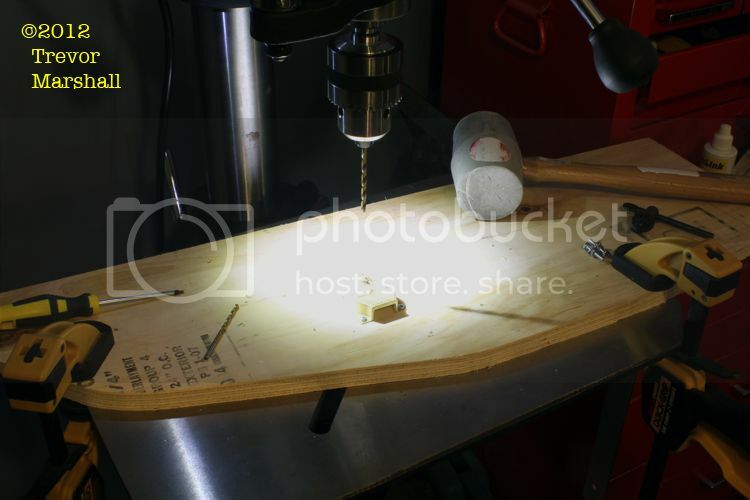 I screwed a housing to a scrap of plywood and clamped this to the table on my drill press. I started with a smaller drill bit and worked my way up to a Number 20 for final drilling. This was almost – but not quite – a slip fit for an 8-32 bolt. 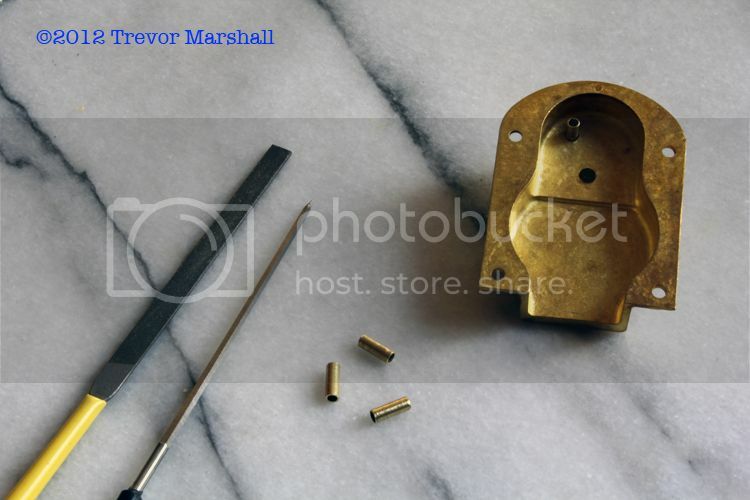 In fact, it allowed me to use the steel bolt to cut threads in the brass casting. 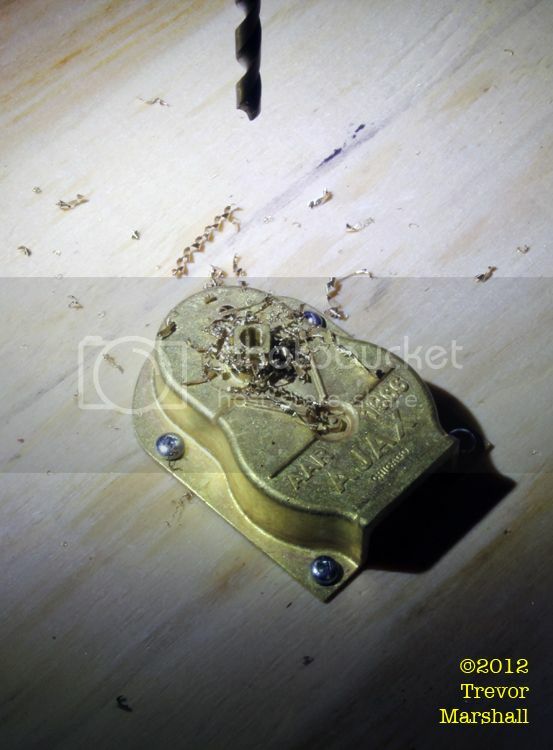 – The wheel and release lever are laser cut steel and were shipped with a protective coating of oil. A quick trip through my ultrasonic cleaner removed this. – To install the lever, I slipped it over the tube. 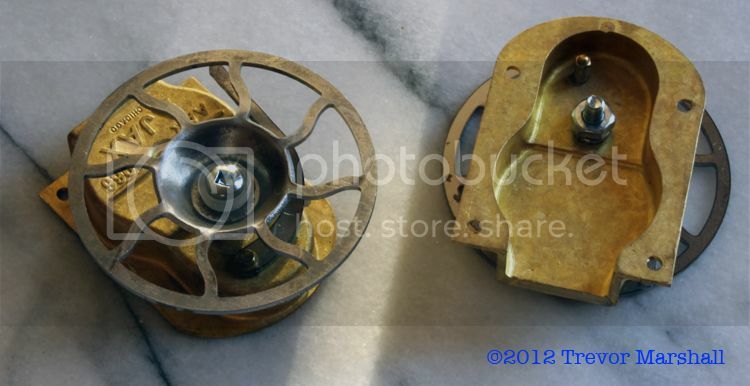 I then slipped a brass hex-head bolt and washer in place, and ran a nut onto the bolt on the back side of the housing. I adjusted the tension so the lever can move, but doesn’t flop about, then added a drop of CA to the nut to secure it in place. – For the brake wheel, I glued a steel washer over the hole in the housing with CA to give the wheel a larger surface to bear against, and added a plastic washer between the brake wheel and bolt head. On the underside, I added a lock washer and a nut. I adjusted the bolt until I could turn the wheel, but it won’t spin freely. Again, I added a drop of CA to the nut to lock things in place. For the air hoses, I found some appropriate tubing (in this case, copper – because that’s what I had on hand). I cut eight pieces and then inserted a piece of coat hanger wire inside each. This kept the tubes from collapsing when I introduced a 90 degree bend into each pipe. I then secured a bent pipe into the back of each valve housing with CA – being careful to create pairs so that when mounted on the fascia, they would face each other. 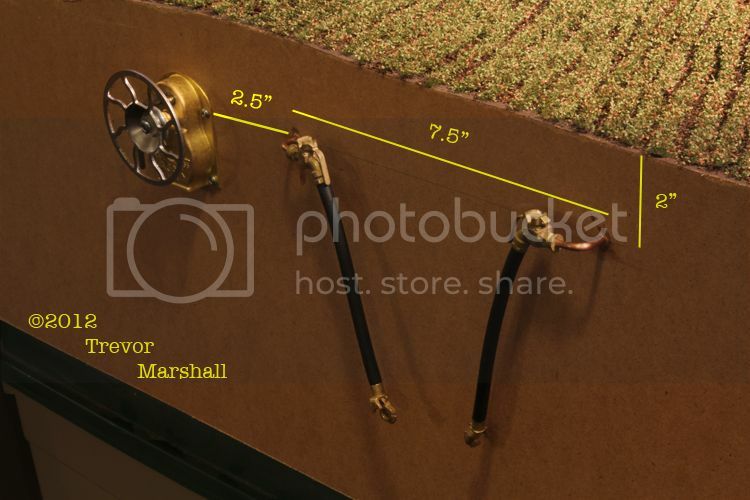 The brake wheel is secured to the facia with four Number 4 screws. To mount the air hoses, I glued wood blocks behind the fascia, marked and drilled mounting holes that are press fit, then added a bit of CA when I was happy with their location to secure them. 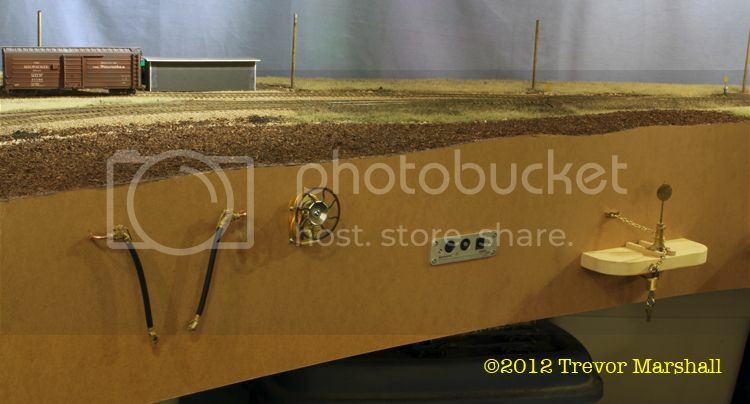 Two inches down from the top of the fascia keeps the gear below the scenery. I mounted a hand brake and paired air hoses at each end of the siding in St. Williams. I also added a set of these operation aids at the yard throat in Port Rowan. The fourth set is located near the Port Rowan depot, making it handy for setting brakes on the passenger equipment or on cars left at the feed mill at end of track. I’ve already started an operating session using these aids and I’m very pleased with how they help represent the work. When I need to set brakes, I reach over to the nearest brake wheel and give it five or six turns for each car I’m setting. To release brakes, I pull the lever up and return it to its resting position. I normally leave the air hoses connected so when I need to represent that activity, I disconnect then reconnect the glad hands, repeating for each car that needs to be connected. Most importantly, with these aids in place I’m now thinking more about when I need to set or release hand brakes, or connect air hoses. That’s adding more play value, and more time, to my operating sessions. This week I finally received my subscription copy of the October 2012 issue of Railroad Model Craftsman magazine and I really enjoyed the cover story, which looks at how George Dutka and Don Janes have each modelled White River Junction, Vermont on their layouts. I met George and Don several months ago at Pierre Oliver‘s place. It was a real treat getting to know them. If you want to see more of their work, check out George’s White River Division blog. Tell ’em I sent you!